How do you introduce your pet to a raw diet? We wrote the book. 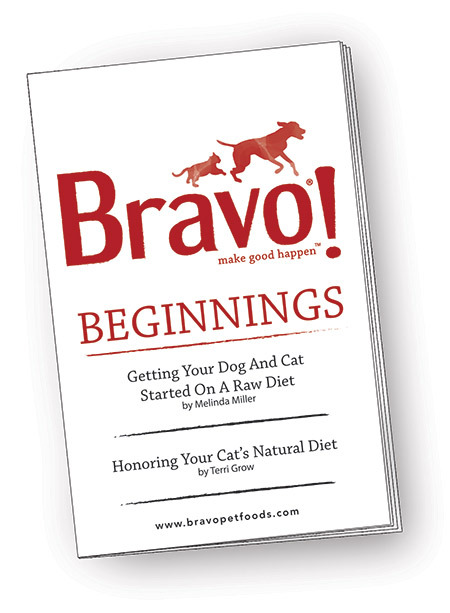 This informative booklet was written exclusively for Bravo by Melinda Miller, a nationally recognized pet dietary and behavioral consultant who has been professionally involved with companion animals for over 40 years. Melinda is also co-founder and current president of the North American Raw Petfood Association. Inside, you’ll find everything you need to know about the hows and whys of feeding a raw diet. Very educational – and only available from Bravo! An authority on nutrition and complimentary therapies for animal health issues, Terri Grow is the owner of an internationally recognized holistic pet store. Her passion for advancing species-specific diets and raw foods for cats has helped spawn a new movement within the industry. In this supplementary chapter to the Beginnings booklet, she provides caring parents of cats with a wealth of common-sense nutritional advice. This material has been written and published for educational purposes only. The contents are not intended to impart veterinary medical advice or services.